Merry Mansfield, the eponymous Razor Girl, specializes in kidnapping for the mob. Her preferred method is rear-ending her targets and asking them for a ride. Her latest mark is Martin Trebeaux, owner of a private beach renourishment company who has delivered substandard sand to a mob hotel. 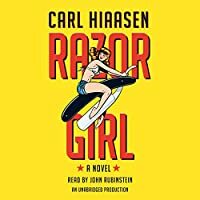 But there's just one problem: Razor Girl hits the wrong guy. Instead, she ends up with Lane Coolman, talent manager for Buck Nance, the star of a reality TV show about a family of Cajun rooster farmers. Buck Nance, left to perform standup at a Key West bar without his handler, makes enough off-color jokes to incite a brawl, then flees for his life and vanishes. Now a routine promotional appearance has become a missing persons case. And Andrew Yancy, disgraced detective-turned-health inspector, is on the job. 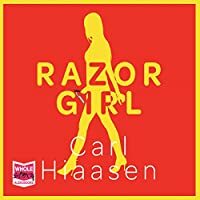 That the Razor Girl may be the key to Yancy's future will be as surprising to him as anything else he encounters along the way -- including the giant Gambian pouched rats that are haunting his restaurant inspections.